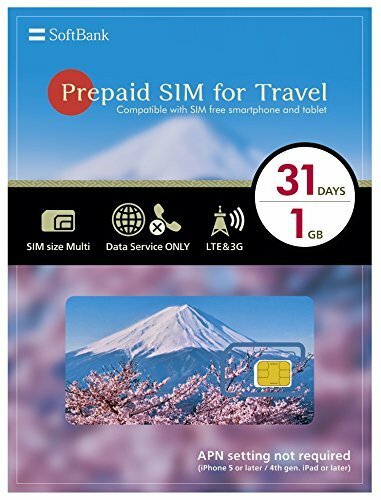 "Prepaid SIM for Travel" is a prepaid data-only SIM service for foreign visitors in Japan. Use data communication domestically in Japan. - SIM size Multi, Data Service ONLY, 4G LTE & 3G. - This service can only be used with SIM-lock-free terminals. - Activation procedure requires mobile phone with camera and a photo to be uploaded of your original passport. - Credit card is required to purchase additional plan packets (VISA/MasterCard/JCB). - Persons under 20 years of age may not apply. This service uses the SoftBank network. Usable systems and frequencies for your terminal are the following. Additional plan : 500MB / 31 day plan, Period of validity is 31 days including date of purchase. Price : 1,620 Japanese yen, Indicated plan prices include tax. Depending on your terminal's OS type and version, setup procedure and names of items may differ. Setting and application is required before using the 4G prepaid sim. 1. Insert the sim card into your phone and set up your phone. 2. Application through the special Prepaid SIM for Travel web site is required. SIM size Multi, Data Service ONLY, 4G LTE & 3G. This service can only be used with SIM-lock-free terminals. Activation procedure requires mobile phone with camera and a photo to be uploaded of your original passport. Persons under 20 years of age may not apply. If you have any questions about this product by Softbank, contact us by completing and submitting the form below. If you are looking for a specif part number, please include it with your message.